We had our first big snowfall one week ago so winter is officially here in Wisconsin. Children like to catch snowflakes on their tongues as it falls from the sky but I recently read that you should never eat snow. Why? Snowflakes form on small pieces of dust. When they fall from the clouds they pick up pollution in the air, so if you eat the snow you might also be eating pollution and dirt. The emperor of Rome (Nero) had a good idea in 37 A.D. when he had his servants get snow down from the tops of mountains and mix it with honey or fruit juices for him to eat. Maybe the snow was cleaner back then without pollution to worry about. Nowadays we eat a similar treat, called snow cones. 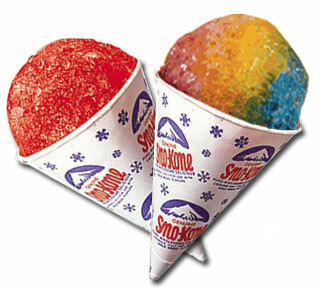 A snow cone (also called sno-cone) isn't made with real snow, just shaved ice that looks like snow, which is put in a paper cup, then topped with a fruit-flavored syrup. This North American favorite originated in the 1850's due to the presence of ice houses, necessary for commercial refrigeration back then. The shavings and small pieces from the ice blocks were given to children, with their mothers creating the fruity syrup for a tasty treat. So while I don't encourage eating snow, I highly recommend snow cones, an icy treat that has endured for over 160 years, or even longer if you want to praise Nero for the creation.